Rushing around or rearranging your day to get to a yoga class can feel stressful. Often, a studio’s schedule doesn’t work with yours and you just can’t make it to class. Of course not. (This is why we created online yoga classes you can take on your own time, at your own pace. Bonus: there’s a free 7-day trial!). It can also be tough to find a peaceful spot to practice yoga at home and to create your at-home yoga space. It’s easy to lose focus when you see the pile of laundry you haven’t finished or when your dog won’t stop licking your toes. How do you hold yourself accountable and practice yoga at home without distractions? The key is a quiet yoga space with limited distractions. You don’t need too much for your home yoga space. Just work with what you have. Even the corner of your kitchen will work if it has the space for your mat (and no one is cooking in there at the time, of course)! Try putting down your mat and test some poses in a few different spots. Make sure you won’t smack a leg into the wall. You’ll need a way to watch online yoga classes if you choose, but stash away anything you don’t immediately need (like a phone or tablet) to avoid distraction. There’s nothing like the ol’ “I’ll just email them back really quick” excuse to grab your phone and totally lose focus! Keep anything you might need to practice within arm’s reach of your yoga space – like a bolster, strap, towel, or water. 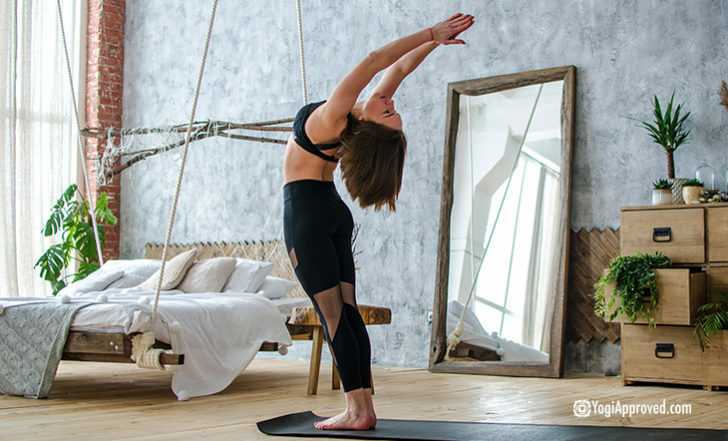 More light can create energy for a high intensity yoga class, and less light can calm you down for a more restorative practice, so make sure you have a sufficient amount of light as needed for the style of yoga you have planned. You can use candles to add light or to create a more peaceful environment for the sweetest Savasana! You can even practice outside at a specific time of day, if that works for you. Find a space that will work for you temperature-wise. Can you adjust the room’s temperature, either with a thermostat, fan, or by opening a window? It’s easy to get distracted if your home yoga studio is too hot or too cold. 6. Make Sure It Brings You Joy! Find a thing or two that make you happy and bring them into your home yoga studio, even if it’s just a vase of flowers in front of your mat, a colorful blanket, or a little spray of lavender oil to enhance your Savasana. Remember, your home yoga studio doesn’t have to be a huge space dedicated to yoga and yoga only. Even if you have to slide furniture to the side each time you want to practice, it can still beat battling traffic or rushing from work to make it for your favorite studio’s last class of the day. It may take some trial and error to find a spot you love and to learn to focus at home, but we promise it will be worth it. Just make sure you hide any overflowing laundry baskets before you start your home practice! To get you started with your home yoga studio, take the FREE 7-day Yoga Strong Challenge in your new yoga space! This article has been read 750 times. Share it and spread the love! Having a home yoga practice is an excellent way to cultivate a consistent yoga practice on your terms. Follow these 4 tips to start a yoga practice at home!